In this article we will describe a variety of settings that you can see in the iPhone 6 general settings. About Get information about downloaded content, apps, memory, the iPhone serial number and model, your Wi-Fi and Bluetooth addresses, support information, and legal and regulatory jargon. Software Update Use this setting to check for available updates to iOS via iCloud. Siri Turn the Siri personal assistant feature on or off, turn the “Hey, Siri” hands-free mode on or off, set the language, voice gender, and Contacts card to be used, and choose whether Voice Feedback always on or on only when in hands-free mode. 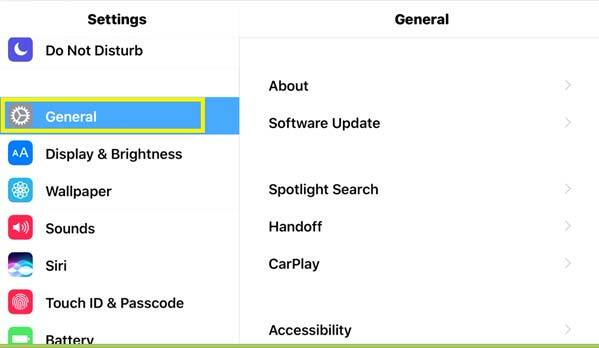 Spotlight Search Access settings for what types of content the iPhone Spotlight Search feature returns in search results. Handoff & Suggested Apps Activate the Handoff feature, which allows you to start an activity such as composing an email on one iOS device and picking up where you left off on another compatible iOS device or Mac. Car Play If you have a car that supports the Car Play feature, use this setting to make a connection with it. Accessibility Set features for using an iPhone for people with visual, hearing, or dexterity challenges. Storage & iCloud Usage Check the items that are backed up to iCloud, manage local storage used by apps, and buy additional storage. Also turn on the display in the status bar for indicating the percentage of your battery power available and get battery usage information. Background App Refresh Turning this on allows apps that you specify to refresh their content when you’re accessing a Wi-Fi or cellular connection. Turning these off can save on battery life. Auto-Lock Set the amount of time for inactivity at which iPhone automatically locks the screen. Restrictions Set restrictions on Safari and iTunes, as well as restrict installation of applications and location services. Specify allowed content for music, podcasts, movies, TV shows and apps. Date & Time Choose 24-hour time and a time zone and set the correct date and time. Keyboard Set keyboard correction features such as Auto-Capitalization and Check Spelling. Language & Region Specify the language for onscreen information and keyboards. Choose a region format for date, time, currency, and phone numbers. iTunes Wi-Fi Sync Sync wirelessly with a copy of iTunes on a nearby computer when connected to a Wi-Fi network. VPN Configure and turn on and off virtual private networks (VPN). Reset Reset all settings or selected settings, such as network or keyboard, to factory defaults.